Want to register? Click here! 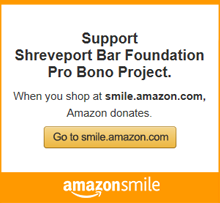 Note: The Shreveport Bar Association Lawyer Referral Service is not associated with pro bono, sliding scale or free legal services. For more information on free legal services contact Legal Aid of North Louisiana at 318-222-7186 or Shreveport Bar Foundation Pro Bono Project at 318-221-8104. The SBA Lawyer Referral Service provides an initial consultation for a fee of $25.00. This fee must be paid by money order only and made payable to the Shreveport Bar Association upon arrival of your first appointment with the attorney. Complete the form below to receive a lawyer referral. Call the lawyer to schedule your consultation. You will need your confirmation number. Bring your confirmation number and money order to the attorney on your first visit. The client and lawyer decide on further legal services and fees. You can only request 1 lawyer referral per week, per category. Note: No Lawyers are able to handle Tenant Law at this time.